2013 Outlook: Jerez ended up missing a large chunk of the 2012 season due to a hand injury, which took a bite out of his potential developmental progress. The athletic outfielder brings an element of speed to the diamond, timing as well above-average out of the left-handed hitter’s box. Jerez’s main areas of work heading into the season are his pitch recognition and approach. The 20-year-old presently is slow to react to off-speed pitches, which often leaves him defensive during sequences. The ability to pull the ball hard with back spin hasn’t yet shown in game action. Jerez needs to learn to slow things down and let his natural bat speed take over in order to make solid contact more often. An assignment in the South Atlantic League will challenge his offensive skills, especially given the break in develop time. Jerez has the natural ability to begin taking strides forward in 2013, with this year being a good early indication of how he is adjusting to the rising level of competition. 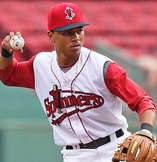 2013 Outlook: Betts’ athleticism is consistently on display, whether it is in the box, the field, or on the basepaths. An above-average runner, he shows solid judgment when stealing bases and an eye for reading pitchers’ deliveries. That should continue when he makes the jump to full-season baseball this year, and he projects as a player who can be an effective base stealer at each stop in the ranks. Betts will be tasked with continuing his development adjusting to professional pitching, which showed improvement in the latter half of his year with Lowell in 2012. Power will not be a part of the 20-year-old’s game, but he has the bat speed and type of compact stroke to round into a gap-to-gap line drive hitter. He will be pushed to make strides with improving how often he makes solid contact in Greenville this season. Betts shows the ability to get the bat on the ball, but it is often weaker contact when he puts the ball into play. This season should be a glimpse as to whether the young infielder is proving that he can handle the pro game in his first taste of the full grind of the season. 2013 Outlook: Progress has been slow for this outfielder, spending the last two seasons in extended spring training before assignments in the Gulf Coast League and New York-Penn League. Perkins’ stall in progress was compounded by an injury that ended his 2012 season after 42 games. The 21-year-old is likely to get the bump to full-season ball this year, putting to test his overall skill set. Perkins is athletic for his size, although his body has gotten on the soft side. This spring will be a good chance to see how prepared he came into camp. The former high school football star has always been a “project” since signing with the organization, but does show glimpses of the raw tools, especially natural power, that led the organization to signing him away from a football scholarship. Perkins has a long road ahead of him rounding out his game. There’s considerable growth needed polishing his hitting skills. 2013 will be a good indication as to whether there are signs of life in the overall game or things just aren’t coming together. 2013 Outlook: Meneses began the 2012 season in Double-A, but it became evident quickly when scouting him that he was over-matched at the level, eventually being demoted to High A. The infielder is still young, but a round of adjustments are in order when the 21-year-old likely gets a second crack at an extended stay in the Eastern League to start 2013. Menses shows a compact stroke and ability to barrel up offerings. The main hurdle is toning down the aggressive approach at the plate, while also showing that he is capable of handling more polished arms consistently. Meneses often gets himself out, with little plan at the plate. The bat is likely to always be on the light side, but traction can be made. The overall skill set is there for the ceiling of a utility player at the major league level. He can play third base, shortstop, and second base, with second being his best overall position on the diamond. Some early season success will go a long way towards giving Meneses some confidence in his hitting skills. Double-A is typically the proving ground for prospects and where the ability to adjust really begins to show. After initial failure, this year will be a good look if that ability is passing the test.